Off to the gym, that is! Yesterday morning we did, as I blogged about, go to the gym and try it out (Fitness19). Mike went through a little of the circuit training, but I just walked the treadmill for 30 minutes. 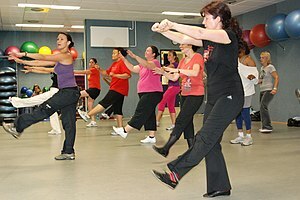 After discovering cardio via Zumba, I thought I was going to literally die from boredom after doing it. Ha! So Mike and I discussed it and figured that he would join and I would not, since this particular gym doesn’t have any classes; just free weights, circuit training (strength training machines) and cardio equipment. I know that I need more than just cardio (classes and such), but I don’t really know what I’m doing with the circuit training machines or free weights, so I didn’t want to waste the money to just come walk the treadmill, since that’s what I would end up doing, which would then equal not going at all. We sat down to talk with the owner and explained this. He stated what I already knew – the classes are great (and he really had great things to say about Zumba, so that’s good), but said those really just replace the treadmill and recumbent bike, etc. and that I would still need some kind of strength/resistance training in order to build some lean muscle to help burn fat 24/7. I agreed, because I know he’s right, but stated I don’t really know what I’m doing in those areas so I wouldn’t likely get much benefit from the machines. Then, he gave us the deal to end all deals. I essentially got to join for free (SCORE) and he threw in an hour and a half with his best personal trainer (who is also a nutritionist) to get us each started on a plan. He explained that the trainer would go through our goals, then tell us exactly which machines to use, in what order, for how long, etc. and then actually show us how to use them. Agreed – sign us both up!! Oh, and the dues are only $10/mo and NEVER increase!! That is winning!! Tomorrow morning I have my consultation at 9:00 am and I’m slightly excited. I won’t say I’m overly excited, but I am a bit, because Mike had his this morning and I was very encouraged by what he had to tell Mike. I really do believe that if I can stick to something, I can see some very rapid changes as far as getting in shape and toning. On the weight loss front, I was disappointed today to only have shed 2 of the 7 lbs I gained over the weekend. I usually am able to shed more of it the first day by doing the VHP shakes and restricting carbs. Maybe it’s because I exercised twice yesterday and therefore was still a little dehydrated? Who knows. Hopefully tomorrow will show more results in that area, because I’m getting REALLY tired of losing the same weight over and over again and looking at the same numbers on the scale over and over again. I at least want to get back to my SlimGenics goal weight. I LOVE Zumba too!!! I can’t find any classes that fit with my schedule right now, but when I did take those classes it was awesome and it’s one exercise that I actually did enjoy!